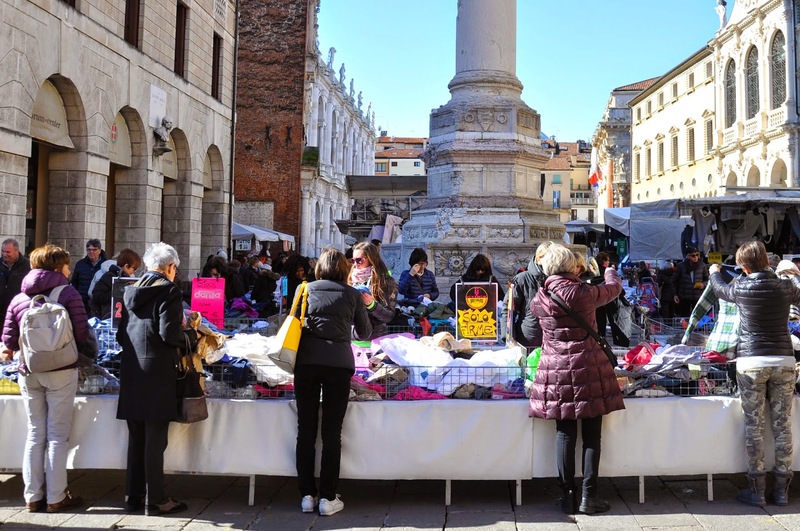 Twice a week Vicenza’s main square plays host to the town market. 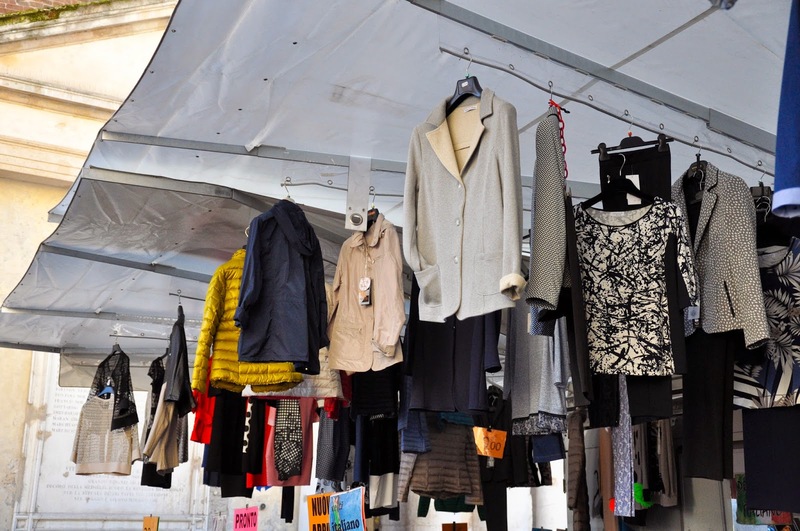 On Tuesdays the colourful stalls are contained within the centuries-old Piazza dei Signori. On Thursdays they spill beyond it and take over the centro storico. It is a big event. Especially if the weather is good. 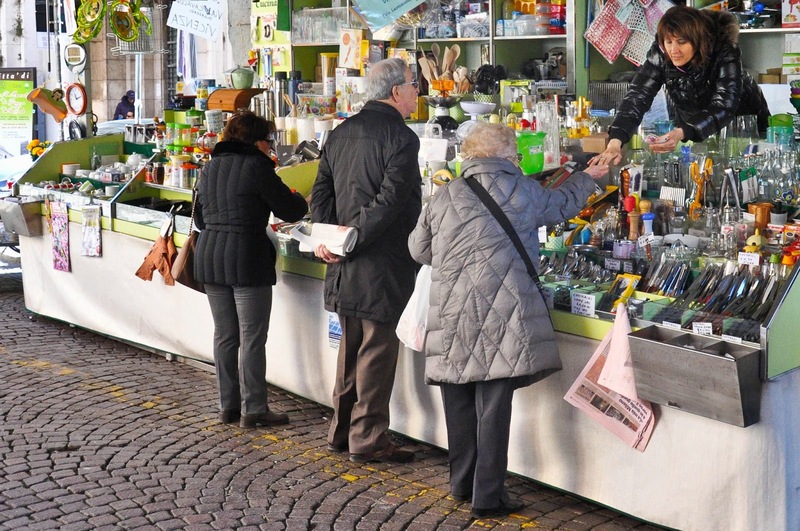 People come in their droves to peruse the goods on offer and stock on anything from pants to polenta and pancetta. You have to be quick though. The vans of the sellers start arriving early in the morning. Swiftly they unfurl the huge awnings, build up the metal structures, merchandise the stock and trading begins. By 1 pm the food starts selling out. By 2 pm the trading day is mostly finished. The unsold goods get stuffed back into the vans, the awnings are neatly folded into ingenious rooftop carriers and off the market goes until it is next due in town. Back in 2012 my then boyfriend (now husband) and I spent a few glorious days in Tuscany. 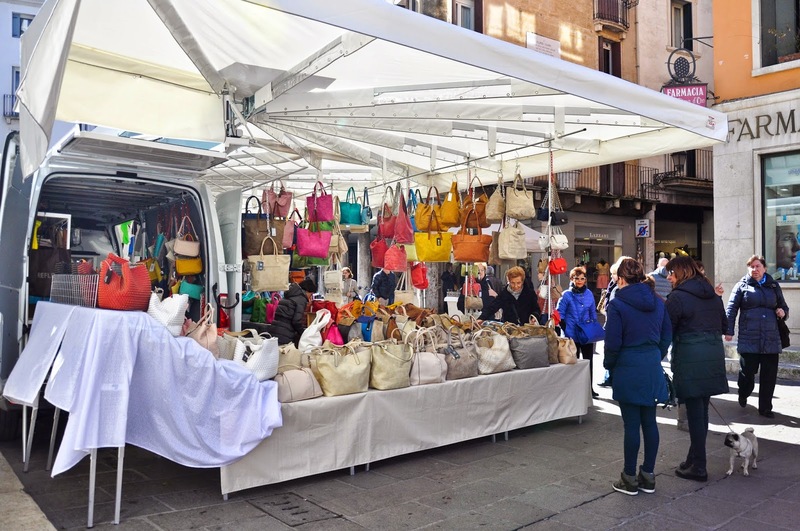 Upon reaching the medieval walled town of San Gimignano I was disappointed to find out that it was market day and the fabulous central square was covered with stalls selling tracksuits, roasted pigs and what-nots. As a tourist, I felt I had the right to postcard-perfect representations of visited places. And the market felt too messy to be that. My boyfriend though took it in his stride and declared the day a success, as he enjoyed seeing the locals going about their business and the market, he said, is a big part of daily life. So, as we now live in Italy and want the full immersive experience, every now and then I go down to the market to have a look. 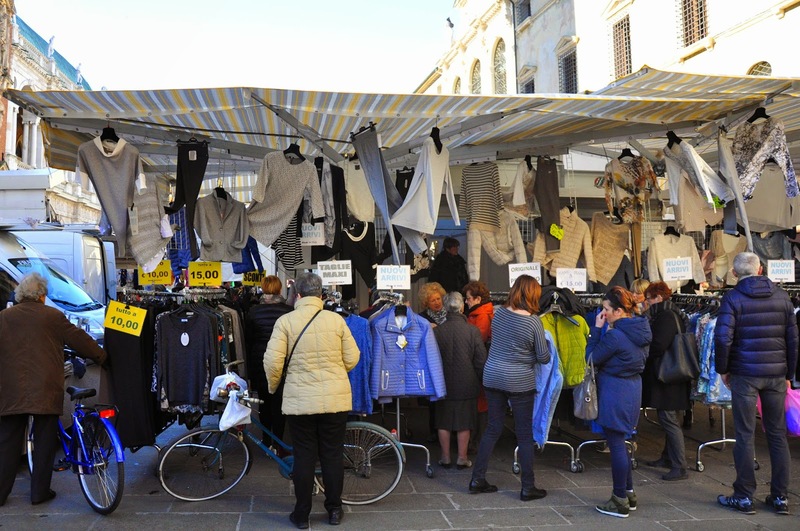 The market in Vicenza is nothing like the fashionable markets that have sprung all over London. There is no pretence, no burning incense sticks and no street food from all over the world. …or piled high in baskets for people to peruse. As for the food stalls – they focus on local produce. Fruit and veg, cheese from Asiago, saussages and salami, roasted chicken, fresh fish, fried seafood, you get the drift. It’s all quite messy, incongruous even. The mundane stalls huddle in the shadow of famous buildings by renowned architects. 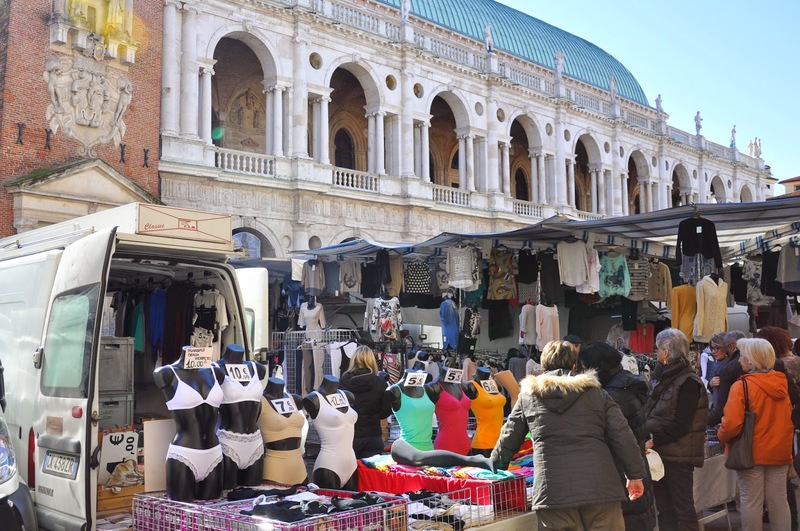 Palladio’s glorious Basilica serves as a backdrop to pants, vests and jackets competing for the attention of the customers. Further away, the pastel colours of upholstery fabrics are beautifully offset by the building of the Italian Posts. 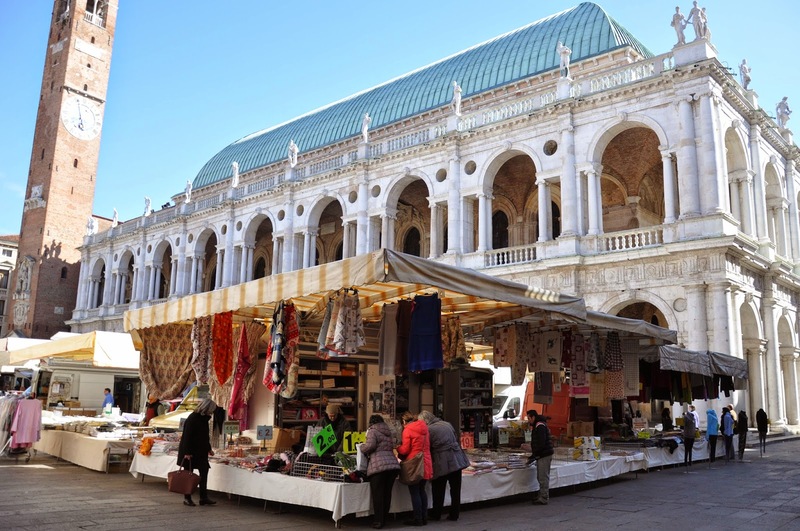 What the market does for Vicenza though is to bring it to life. 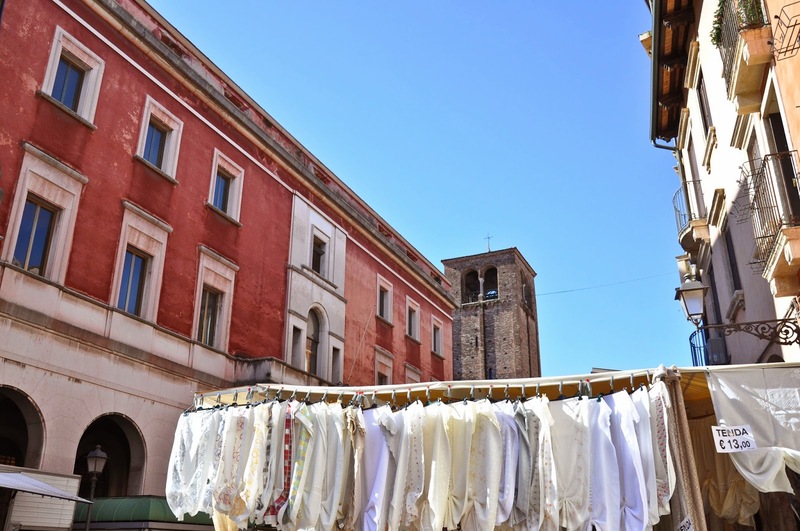 This gorgeous Italian town often seems almost deserted with hardly any people roaming its picturesque, but sleepy streets. 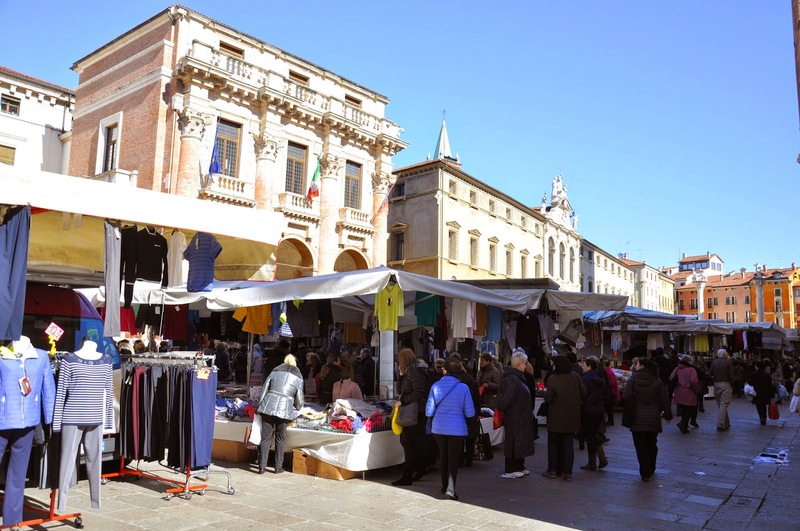 On market days Vicenza truly awakes. A constant throng of people pulsates between the stalls. There is vigour in the air with all the trading that takes part. 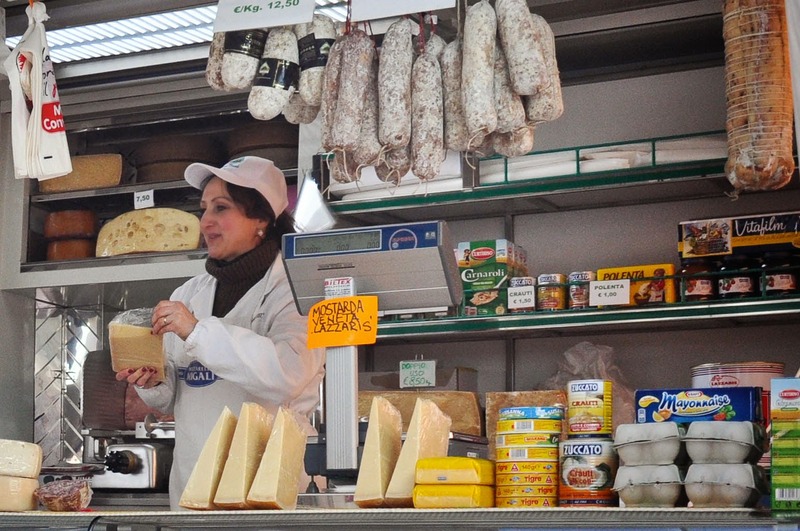 Sellers chat to customers, show them their wares, cut them a slice of cheese here, weigh them a piece of sausage there. When a deal is made, they count the change in the hand of the customer and then wrap the purchase ready to go to its new home. 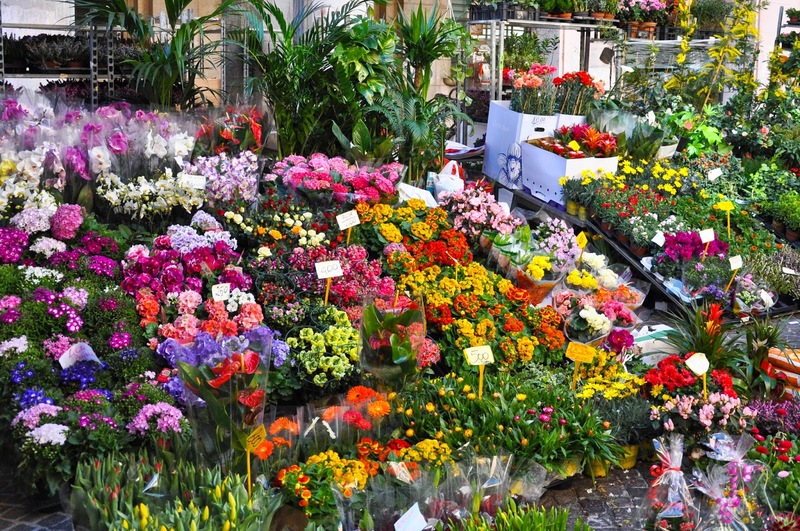 The flower and plant stalls add bursts of colour to the proceedings. 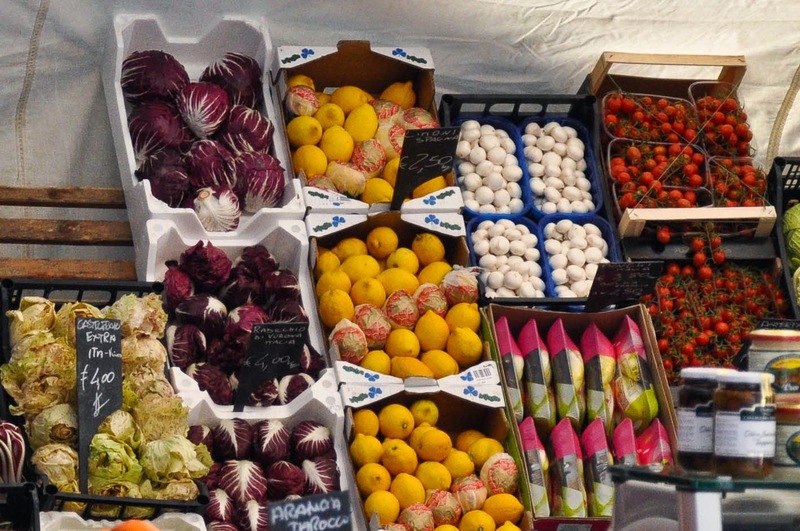 The fruit and veg stalls lure you with fresh seasonal produce. Around the huge food trucks the smell of appetising dishes is too hard to resist. 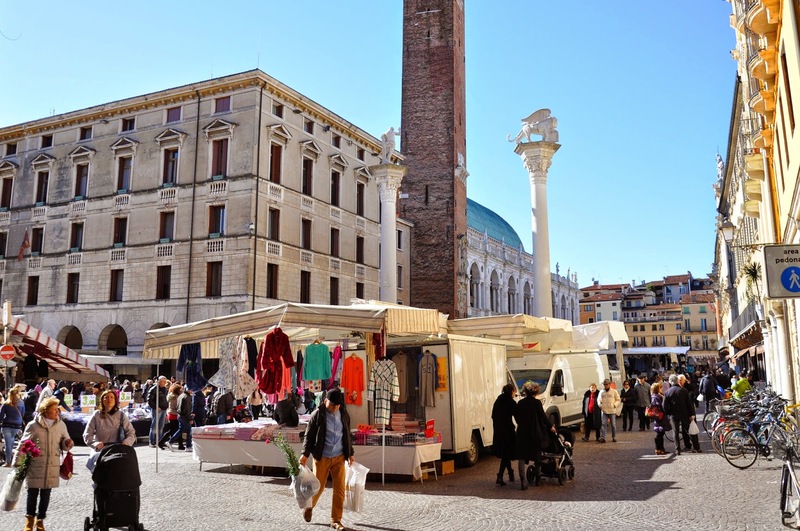 If you find yourself in an Italian town in the midst of a market day, embrace it and enjoy it, no matter how much it seems to spoil the panoramic views you want to selfie yourself against. 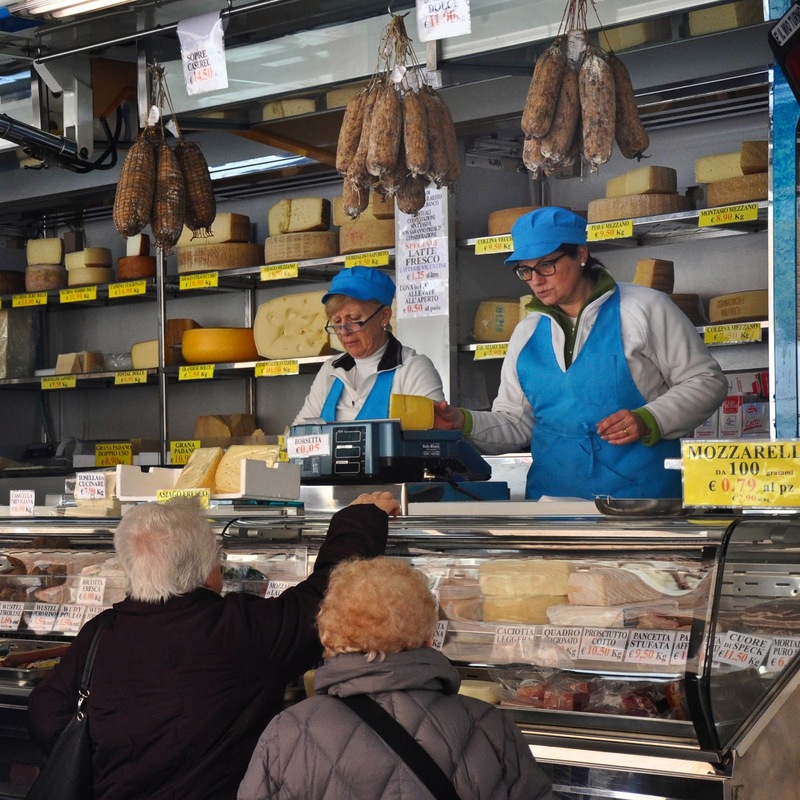 Buy yourself a little bit of cheese, some sliced salami, a piece of lasagna and a couple of hundred grams of fried seafood, then enjoy them all while watching people take part in an activity that has defined and still defines our world and our culture – buying and selling at the market.